White sliced bread made with rice flour, tapioca, maize and potato starch. 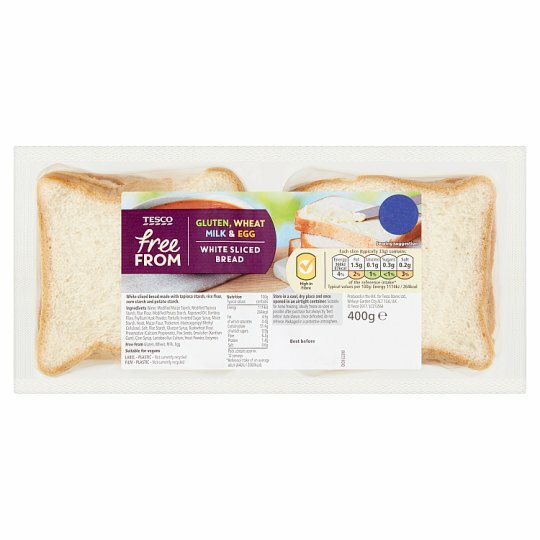 Why not try our Sliced White Loaf. It is free from gluten, wheat, milk and egg. It is perfect toasted or used to make a sandwich. INGREDIENTS: Water, Rice Flour, Modified Tapioca Starch, Modified Maize Starch, Modified Potato Starch, Maize Starch, Rapeseed Oil, Bamboo Fibre, Partially Inverted Sugar Syrup, Psyllium Husk Powder, Yeast, Maize Flour, Thickeners (Hydroxypropyl Methyl Cellulose), Salt, Rice Starch, Glucose Syrup, Buckwheat Flour, Preservative (Calcium Propionate), Flax Seeds, Emulsifier (Xanthan Gum), Corn Syrup, Lactobacillus Culture, Yeast Powder. Store in a cool dry place. Open carefully making sure not to pierce the other portion pack. Once opened store in an airtight container and consume within 48hours.